Not since the Goosebumps series have I been this excited about a horror novel, and Poblocki takes the horror genre to a entire new level with the addition of the Shadow House app. Scholastic is thrilled (and chilled) to present readers with a terrifying new twist on the old haunted house story. From master spooky storyteller Dan Poblocki comes the first book in the highly anticipated Shadow House series, The Gathering (Shadow House, Book 1). Some houses are more than haunted...they're hungry. Readers are invited to stop inside this house and story via the Shadow House app available for tablet and phone in Android and iOS. Images in the book unlock digital ghost stories in the app, where the choices you make determine your fate. Five children--Dash, Dylan, Poppy, Marcus, and Azumi--each think they've been summoned to Shadow House for innocent reasons. 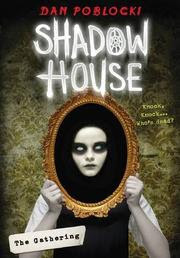 But there's nothing innocent about Shadow House. Something within its walls is wickedly wrong. Nothing--and nobody--can be trusted. Hallways move. Doors vanish. Ghosts appear. Children disappear. And the way out? That's disappeared, too. The books opens with Poppy, a young girl who sees a girl in the mirror. She's sure she's not alive, but no one else sees her, and cruel kids begin calling Poppy "crazy Poppy." An orphan, Poppy finds out that she may actually have a family, and the school master has been keeping this from her. Intent on finding out about the mysterious Delphina Larkspur, Poppy wonders if she needs the girl in the mirror, her only friend, or if finding her mysterious family is more important. And this is just the first story. Eventually, all five children end up in the same house--the same haunted house. Follow their stories in the book, and don't forget to download the app to create your own scary adventure!